Here at Coffechino we like to provide you with a large range of ingredients for your drinks machines or business, so that you can give the highest quality products to your customers. Our coffee beans are sourced globally to give you the best taste and variety possible. We have traditional espresso richezza coffee beans, blended with beans from South America and Africa. We also have the distinctive Arabica which is blended with beans from Africa, South America and India. Coffee beans come from a species of evergreen plant called the Coffea and they start their life as a seed in a berry, they are often referred to as a ‘bean’ because of their resemblance to a true bean. The coffee berries are green when unripe, changing to yellow as they ripen, and finally transforming to a shade of dark red and then black once they are dried. When the berry is ripe the beans can then be extracted and roasted. It is the roasting process and the country of origin that results in the different flavours and aromas of coffee that we have available. Our freeze dried instant coffee is a great choice for those in a rush but don’t want to compromise on quality. It is popular due to its speed and ease of use to create a great tasting cup of coffee. When compared to ground coffee, our freeze dried instant coffee has a longer shelf-life and weighs less. The smooth and mild freeze dried coffee is created from hand-picked Arabica beans from the mountain sides of Columbia and is perfect for an aromatic all-day drinking coffee. 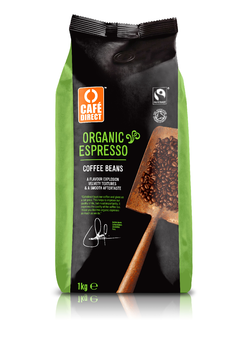 Our range of freeze dried instant coffee support the Children of the Andes, Rainforest Alliance and Fairtrade. We believe in equality in coffee production, which is why we stock a range of ethical/fairtrade products. We have tea, freeze dried instant coffee, coffee beans and ground coffee available which support the Rainforest Alliance and Fairtrade. The Rainforest Alliance certification means that the coffee grown satisfies the high levels of environmental and social performance. It ensures that the farmers follow sound agricultural practices that protect forests, rivers, soils and wildlife while being good community neighbours, whilst also maintaining that workers have decent wages, dignified living conditions, access to health care and education for their children. So whilst you enjoy your cup of tea or coffee, you can rest assured knowing that you are doing your bit to help protect the coffee farmers and their environment. For the perfect complement to your hot drink we offer a range of chocolates and biscuits, from yummy Lotus caramelised biscuits, gooey mini marshmallows or for a bit of after dinner luxury, rolled chocolate wafers and mint chocolate crisp Neapolitans. And, to transform your cups of coffee into a variety of different flavours we also stock Sweetbird coffee syrups, with cinnamon or gingerbread to chocolate or marshmallow, we’ve got something for everybody’s tastes.